Sea Prayer is only 48 pages, but they were 48 absolutely beautiful and heart-wrenching pages. I would expect nothing less from Khaled Hosseini, who is an auto-buy author for me as I have loved and had my heart-broken by all of his books. Dan Williams does the illustrations and they are gorgeous and atmospheric. Here is a link to his website if you are interested in seeing more of his work. I am definitely a fan of his style! The book is a letter written by a father to his son before they board a boat in order to escape their war-torn country. The story along with the illustrations creates something that is very moving and powerful. I appreciate that this book highlights the experience of a refugee, which is something most of us will never be able to begin to understand, and for that we are blessed. I have never read a book quite like this. I am so grateful to Penguin Random House Canada for sending me a copy. I am proud to have Sea Prayer on my shelf. This is a something that I will cherish and share with many people in my life. It is appropriate for all ages. 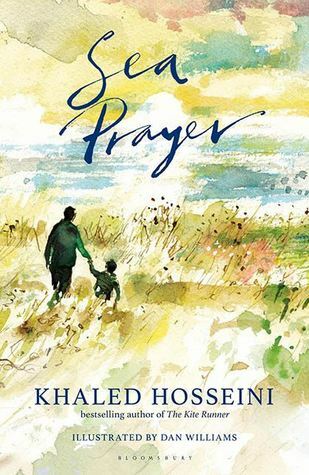 I also think it is important to once again point out that Khaled Hosseini will donate author proceeds from this book to the UNHCR (the UN Refugee Agency) and The Khaled Hosseini Foundation to help fund lifesaving relief efforts to help refugees around the globe. Thank you to Penguin Random House Canada for sending me a copy in exchange for an honest review. I really want to read this. Thanks so much for posting. It’s really a great little story. It’s a beautiful book as well! Wonderful review! I feel inspired to see more books about the refugee crisis. Thank you! I would be curious to read more books like that as well! I’ll have to look for some. This sounds like something that will definitely make me cry… I love Khaled Hosseini’s writing and I need to read more by him! It is amazing how emotional this book makes you in so few words. Truly special! Great review! I’m so looking forward to reading this one! Thank you! It really is fantastic! I’ve only read the kite runner… but I will have to check this one out! Sounds wonderful!😊 Happy Reading! Great review! It’s really a great little book. Thank you!